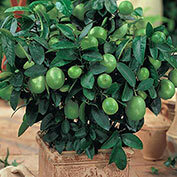 Dwarf Key Lime | Gurney's Seed & Nursery Co.
Glossy evergreen foliage, sweetly scented flowers and edible fruit in one! The Dwarf Key Lime can be moved outdoors in summer, so the bees take care of pollination for you. Pick in 1-3 years. Zones 9-10. 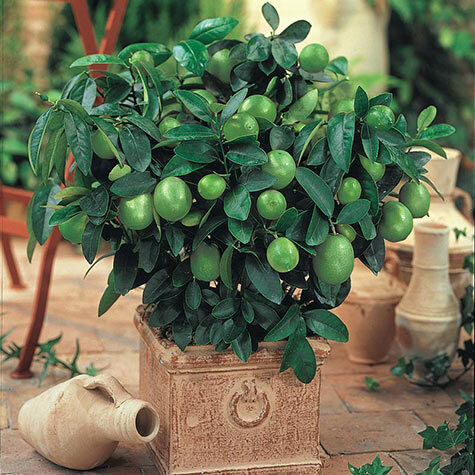 Botanical Name: Citrus aurantifolia 'Key of Mexican'. Spacing: 1 plant per pot. If planting in the ground in zones 9 - 10, space 6 feet apart. Depth: Plant at same depth as in the pot it is shipped in. Pollinator: Self-pollinating. Will need to hand polinate if the plant blossoms indoors. 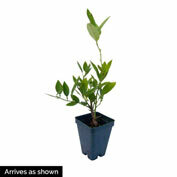 Foliage: Shiny, dark green, evergreen foliage. Fruit: Tender and juicy; very few seeds. Fruits are about the size of a golf ball. Soil Requirements: Well-drained, rich, moist, sandy loam soil. Pruning: To shape and keep at a desired size. Comments: Nothing freshens the air like the pleasant fresh citrus fragrance given off by the beautiful, waxy white blossoms of these unique tropical plants. Move to a bright light indoors for the winter.